There’s been this unwritten divide between designers and developers as long as we have been making websites. People who make things look good versus people who make it work. Those days are over. The backbone behind every website is a string of 1s and 0s. That’s not very exciting when it comes to design. But the actual interface and connecting with a user is. Every tiny detail includes elements of design that someone is supposed to engage with from buttons to navigational elements to forms to watching a video or buying a pair of shoes. The goal is to create something that looks nice, engaging and is easy to use. That’s where design and development meet. API: By providing specifications for routines, data, object classes and variables, and Application Programming Interface allows different websites or software to “talk” to each other and work together. Think of it as a virtual set of building blocks. CSS: Cascading Style Sheets are the backbone of the language used to style websites and display HTML elements visually. UI: The User Interface is everything that the user sees and interacts with in a design. This can be everything from how they use the website and device to every individual element on the screen. UX: The User Experience is what each individual user takes away from interactions with the site. This tends to be expressed as an emotional connection and relates to perceived overall value. Every part of a website is asking users to engage or continue to engage with another part of the site. Whether you are playing a game, reading an article or buying a gift, each action leads you to something else. But how to do you get there? That’s where asking questions come in. If you ask questions in the design process, you can make links between actions, creating a more seamless design with a logical flow. “Nicely Said” by Nicole Fenton and Kate Kiefer Lee is a manual to writing for the web. It also provides a framework of questions that work for every part of the web design experience. How do people use this content or feature now? How does this content serve our goals? What’s its purpose? What are the features of the website? How does it behave? Are there any technical constraints or character limits? Fenton wrote even more about other questions that websites “ask” all the time. We are talking about the personal details that help users relate to the sites that they interact with. “Each of these interactions should feel like a conversation between two people who trust each other and deserve each other’s trust,” she writes. The answer to these questions establishes the nature of the interface-user relationship and greatly impacts the design. Think of it this way: If a user is not willing to tell you their location, the design and user interface will not be effective if it is based in geolocation; the design should approach the user in another way. When websites are coming together, everything tends to fall somewhere on a map. You can plot the course from one user interaction to the next. (Which is great for visual thinkers.) So think of the design/development process in terms of A vs. B: What’s the next step, A or B? Every element should have a simple purpose that is easy to define and describe. (Click to play; click to scroll.) If you can’t make it understandable in a sentence, you might want to rethink the design strategy. Personally, I started with a little HTML with purpose. I made a list of things I wanted to know how to do and learned them from the inside out (i.e. how to change a color of a site element using a HEX value in the CSS rather than clicking a box on a color picker.) There are plenty of tools available from online classes and tutorials to in-person training in your area. All you have to do is sign up and get started. Learning web development is not just learning about frameworks and code. It is about the thought process. Designers can think like developers en route to creating a successful website. You just have to be open to the idea. Understanding that some of the thought processes are similar – visual thinking and weighing solutions and outcomes – are a part of any design or development project. 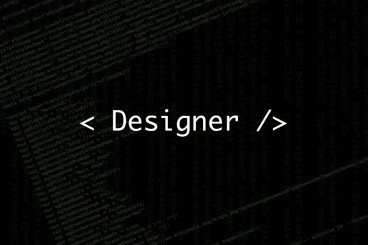 We are all designers/developers in today’s market.